Jerome Randle goes by many names these days. As Jerome, he’s won NCAA tournament games and knocked on the NBA’s door for half a decade. Jerome is from Chicago. Jerome was, briefly, responsible for setting up Dirk Nowitzki. But Джером Рендл or, phonetically, Dzherom Rendl, isn’t close to California, Dallas, or anywhere else in North America. He is in Kiev, running the point for the Ukrainian national team. Ukraine was initially chosen to host Eurobasket 2015, which started this weekend, but war in the country’s east with separatists and (probably) Russia forced the tournament to move. This was supposed to be their tournament and now it’s not, on account of the 200-mile battle line running through the country. One player on the roster—Kyrylo Fesenko—has NBA experience, but this is far from Ukraine’s A-team. Phoenix Suns center Alex Len is not with the team, and neither is Kansas Jayhawk Sviatoslav Mykhailiuk. Ukraine’s chances to advance, and to make their first Olympics in 2016, rest instead with Randle. He led the team with 23 points in a recent upset over Italy, and the offense runs through him. If Ukraine qualifies for the Olympics, or wins the tournament, it will be because Randle takes them there. They will be fighting for legitimacy. Randle will be fighting for his career. So how did we get here? Jerome Randle won the Pac-10 Player of the Year award in 2010 at Cal and led the Bears to their first Pac-10 title in 50 years. In 2011, he signed a deal with the Mavericks after an incendiary preseason. But life on the NBA fringes is cruel, and he was waived eight days later, before ever taking the court. He has spent the intervening summers scrapping for a contract at the Las Vegas Summer League and then voyaging back out to basketball hinterlands like Belgium, Ukraine, China (almost, before a foot injury derailed his stint), Israel, and, most recently, Turkey. Playing for a far-off Black Sea nation is an unsexy—and unpaid—opportunity but it’s basically in the way of a prestigious internship. Randle is betting that he can give a performance that will demand attention and bring opportunities. He doesn’t have a contract for next year, as he’s waiting to see what opportunities a good performance could bring. Due to FIBA Rule 1.21.a, countries are allowed to field one naturalized player on their squads; this has, naturally, led to smaller basketball nations recruiting fringe American players. J.R. Holden played for the Russian national team for years and helped them win the 2007 Eurobasket. Andray Blatche plays for the Philippines right now; Pooh Jeter, formerly of the Sacramento Kings, was the country’s previous mercenary. It was Jeter, along with Randle’s agent, who convinced him to take the chance and head to Eastern Europe. Because this is Ukraine, there are first-level logistical challenges that come with competing in a major tournament. In another recent friendly, Randle matched up across Tony Parker. “He was just what I thought he was. Really quick, crafty around the basket,” he says. “I always looked up to TP as a point guard, him being as small as he is. Well, he’s not really small compared to me, but he can finish really well.” France won handily, but Randle made Parker work. “I like to go up against guys like that to see where I’m at. I see that respect there because he really had to try to guard me.” At Eurobasket, Randle could face off against other point guards with NBA experience, such as Dennis Schröder, Nick Calathes, and Sergio Rodriguez. He will have to prove himself over again and again, as he’s been doing his whole life. The thing about Jerome Randle is this: He is very small. He’s been listed at 5’10” his entire career, but he’s really an inch shorter. This doesn’t prevent him from getting into the lane and finishing over much taller players, though. Like fellow Lilliputians Isaiah Thomas and J.J. Barea, Randle couples his quickness with a barrage of jittery hesitation moves to find little pockets of space near the hoop. He shot 46% from three and 93% on free throws in college, and his range demands defensive attention everywhere within half court, which opens up all kinds of lanes. Couple that shooting ability with his all-world handle, and you have a viable backup point guard; Randle fits the mold of off-the-bench sparkplug, but his size is preventing NBA teams from taking a serious look at him. When I ask him about it, his voice takes on an edge. He has been playing the underdog his entire basketball career, and he is sick of only ever almost getting a legit chance. The divergent paths of Randle and Thomas exemplify the cruelly thin margin for making it in the NBA. They are about the same size, had about the same college statistics, and play a similar hectic style; while they are different players with different tendencies, their pre-draft résumés were more or less the same. Thomas was drafted with the last pick in the 2011 draft and has made a career as a fringe starting point guard. Randle went undrafted and has toiled in obscurity. So while Thomas has been playing in Phoenix, Boston, and Sacramento, Randle has hooped in cities like Mariupol, Ankara, and Charelroi, away from his family and everything familiar. He could come back to the D-League, where his family and the NBA are both closer, but there’s simply not enough money there. “I can’t really take a year off from making money to go to the D-League to chase a dream. The D-League is not going to take care of my family. I have all the respect for them and what they do for guys chasing their dreams, but it’s really not for me at this particular moment,” he says. His time with Ukraine is a hyper-accelerated version of that. He may have only six games to show out, for free, on the Eurobasket stage. Randle is caught in a double bind, as are many fringe players: Earn a comfortable six-figure salary during the year and roll the dice in summer league or stick around North America, make less than $20,000, and hope for a callup. Randle has showed out in Las Vegas year after year, but has yet to stick with a team into the fall. He linked up with fellow Cal point guards Jason Kidd and Jorge Gutiérrez with the Milwaukee Bucks this summer. Milwaukee has both the defensive length to hide a small guard like Randle as well a need for another shooter. But just like the past five summers, Randle left to find work across an ocean or two. To his credit, Randle refuses to mope. “It’s fine. I’ve learned to live with it. I’ve dealt with it for the past four years when it comes to the NBA and I just hope that someone, soon, can really see what I can bring to a team,” he says. He is 28 now, getting to the prime of his career. If that call up comes, it will probably have to come soon. Eurobasket is the biggest stage Randle will have to audition for a contract. Unlike Summer League, he is the man for Ukraine. 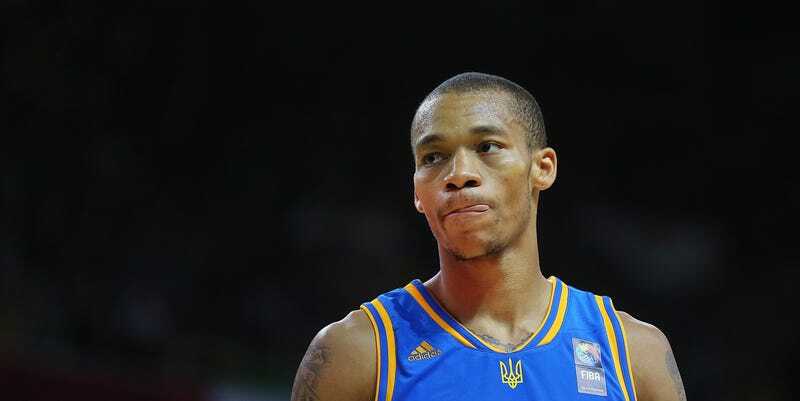 He gets to play, as he says, “Jerome Randle basketball.” There will be no deferring to lottery picks; Ukraine didn’t pluck Randle out of Turkey to have him dribble across halfcourt and hand the ball to some prospect, the way some Summer League teams make their invitees do. The team lost an opening night heartbreaker to Lithuania and dropped a lose one to the Czech Republic, but they are still in contention to advance. If Ukraine makes it to the Olympics, it will be because Randle takes them there. NBA people will be watching him and the rest of his underdog teammates. He has said he might not have the energy to scrap out another Summer League run, so this just may be Jerome Randle’s last prime time chance to make it to the NBA.